Letterman Lover Cheating on Beau with Dave? A report today suggests that Stephanie Birkitt, David Letterman's former assistant and lover, was cheating her boyfriend/accused extortionist Joe Halderman with the "Late Show" host! According to the NY Post, Stephanie spent romantic weekends with Letterman on his ranch in Montana, while her live-in boyfriend Halderman stayed at home in Connecticut. When Joe reportedly became suspicious of the relationship, Stephanie allegedly told him that she was Dave's "best friend," and their relationship was strictly "platonic." 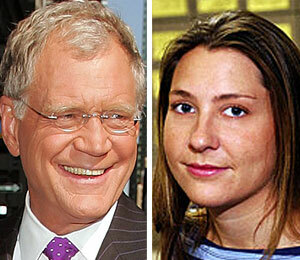 Halderman allegedly found out about Birkitt's affair with Letterman by reading the 34-year-old's diary. He allegedly used the information in Stephanie's diary to attempt to extort money from Dave. Joe was indicted on one count of first-degree grand larceny. Last night on his show, Dave publicly apologized to his staff, who have been heckled by reporters, and his wife, Regina.